KayKiSpeaks.com: KayKi Cosign: The Corner Grille Downtown College Park! KayKi Cosign: The Corner Grille Downtown College Park! I remember the first visit I made to The Corner Grille. It was after having their food at a meeting one morning for work. We were all so impressed. I promised I'd go by and check out the place for myself. The first thing I noticed was how relaxing it is inside! It's like stepping into a coffee shop or something. 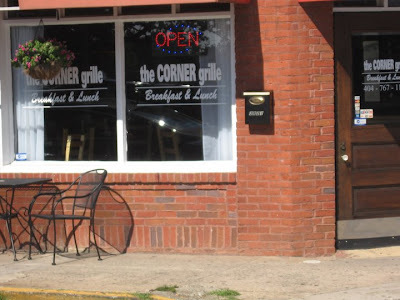 Nothing is more comforting to a blogger, or a person who needs to be able to sit and write anything for that matter, than an atmosphere like the Corner Grille's! 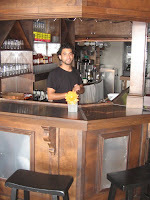 The modern & cozy restaurant is owned by Julian and Annette and it serves a variety of delicious dishes. They serve a chicken & waffles plate (like one you've never had before), a shrimp & grits dish that will make a non grits eater (like myself) order it over and over again, and one of the smoothest cups of coffee you'll ever sip. Did I mention they serve real beignets??? Yes, I had my very first taste of the New Orleans favorite while there. The food is just incredible, but you can get delicious food at many places in Atl right? So what sets the Corner Grille a part? Well, the fact that the food AND the people working there are great! My server on both occasions was Antonio who was very easy to talk to and offered his honest opinion on a few dishes I was thinking about ordering. There was another young lady working on my first visit who was just as welcoming, and then there are the owners. Most of the time I was out in the front eating, Annette was out greeting and conversing with guests while Julian was in the kitchen cooking up the amazing food! Its always great to see the owners of a business working in it! I had an opportunity to chat with both of them for a bit, and as I was walking out I was thinking, that type of approachability in owners is something that will keep people coming back. "I love this place, I'll be back!" or "I had no clue this was over here..I'm definitely coming back!" " The ambiance here is wonderful & so is the service. This is just my first time, so I cant say that all of the food is great, but what I have today is delicious!". For busy people like Chase Lane, The Corner Grille is a perfect place for a nice relaxing meal or even business meeting! I haven't done a review in a while, but I have sent so many people to this establishment that I felt I had to tell my readers about it! I wouldn't dare keep such a good thing from you loves! So if/when you're in ATL..make sure you stop by..you will not regret anything about it!